This recipe is from a 1996 edition of Fine Cooking magazine. I’ve made it several times and always panic if I will be able to find this issue among my stacks of magazines when I need it. Now, I can relax knowing it is on this site whenever the whim strikes. Whether you make this recipe to warm you on a chilly winter night or to serve for a Yom Tov meal, this recipe is a winner! Roast the chicken and vegetables:Heat the oven to 375°F. Rub the chicken with 1 Tbs. of the olive oil and sprinkle generously, inside and out, with salt and pepper. Toss the potatoes, onions, carrots, garlic, and mushrooms with the remaining 2 Tbs. olive oil and the chopped herbs. Set the chicken upside down in a large flameproof roasting pan and scatter the vegetables around the chicken. Roast for 1 hour and 15 minutes, stirring the vegetables several times. Remove the chicken from the pan to cool. Remove the vegetables with a slotted spoon and reserve them in a bowl, with the peas. Don’t rinse out the roasting pan. Pour the fat and juices into a measuring cup or gravy separator. Spoon or pour the fat away from the juice; reserve the fat. Add the juices to the chicken stock. Measure out the fat and add enough margarine (if needed) to make 6 Tbs. Put the roasting pan (which should still have the caramelized bits from the chicken and vegetables) on the stove over medium heat. Pour in the 6 Tbs. of fat and butter mixture; when it’s melted and bubbling, add the flour and stir constantly to make a smooth roux. Scrape up any caramelized remains from the chicken and vegetables. Cook the roux, stirring constantly, until lightly browned, about 5 minutes. Add the chicken stock, bring to a boil, and simmer. Continue to stir and scrape the bottom of the pan. Cook the sauce for at least 15 minutes, whisking occasionally, until it’s as thick as heavy cream. Season with salt, pepper, and more herbs to taste. When the chicken has cooled, pull the meat from the bones, discarding the skin and bones. Cut the meat into small (1/2- to 1-inch ) chunks and set aside. 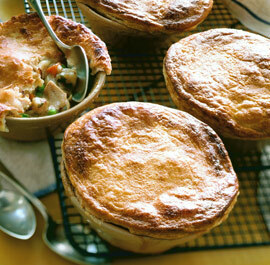 Assemble the pot pies:Position a rack in the middle of the oven and heat the oven to 400°F. Choose six 12-oz. ovenproof bowls or one 2-qt. casserole. Remove the dough from the refrigerator. Lay it on a floured board and roll it out 1/8 inch thick into a 20×16-inch rectangle. Set the dishes (or dish) for the pot pie upside down on the dough and cut around the rims with a knife or pastry cutter. (If you like extra pastry, cut the pastry a little larger than the top of the dishes.) Stack the pastry pieces on a plate, separating each with waxed paper or plastic wrap. Refrigerate until ready to use. Divide the chicken, vegetables, and sauce among the dishes. Lay the pastry on top, pressing along the edge of the dish to seal. Bake the pies:Blend the egg yolk and parve cream. Brush the mixture onto the pastry with a pastry brush. Put the pies on a baking sheet to catch any drips. Bake on the center rack in the 400°F oven for 50 to 55 minutes, or until the crust is thoroughly browned and puffed. Steam will escape along the edges of the pastry. Yields six 12-ounce pies, or one 2-quart pie. is the calorie count per serving or entire recipe?? ?